The image left shows the two standing stones that form an alignment at Baltray, the stones are nine metres apart and the alignment originally consisted of three stones, one of which is now missing. I was quite surprised to see how tall these stones are, the largest being around three metres high and the smaller stone is over two metres high. 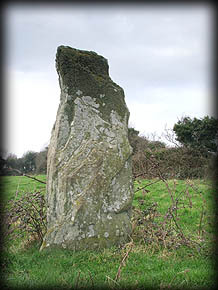 The largest stone marks the summer solstice sunset and also the winter solstice sunrise. There are also another number of significant alignments. 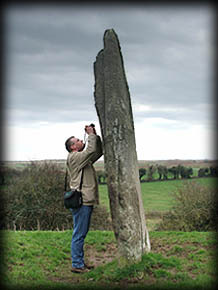 For more details on the alignments I suggest you visit the website of the people who made these discoveries Mythical Ireland . 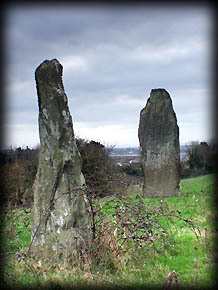 The image left shows the smallest stone and the image below shows the side of the larger stone that marks the solstice alignments. The stones are standing next to an ugly modern concrete structure that acts as a guide to the stones. Situated: From Drogheda, Co Louth take the R167 East to Baltray. In Baltray turn left at the Nineteenth Pub and drive up to the last house, park here and continue walking up the track till you come to a double gate on your right, From here you can see a concrete structure in the field, the stones are just visible standing next to it. Discovery Map 43: O 1440 7818: Last visit Jan 2006.